At Holmes Property Maintenance, your comfort is our greatest concern. That’s why it is important for us to know what you want so that we can come up with the best possible solution. Our lawn maintenance services and prices are the best on the market. Just ask our clients who requested our help with lawn mowing, spring cleanups, and turf maintenance just to name a few. You shouldn’t concern yourself with things like prices, rates, and payment methods. If you call us right away, we will explain our quick and painless process over the phone. The only thing to do after contacting us is to sit back, relax, and go about your daily activities while we take care of everything. Your comfort and well-being are very important to us, and we’ll do everything possible to be as less intrusive as possible when working on your lawn. 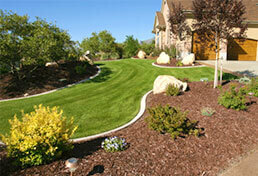 Our company provides only high-quality lawn maintenance services. So, whether you’re looking for someone to clean your yard after a wild party or for someone to trim the trees, shrubs, and bushes, we are the right choice. This service is a must-have for a healthy and green lawn. Our spring cleanup service includes pruning ornamental plants, thoroughly cleaning your lawn and landscape, redesign the edges that separate flower beds from the lawn using professional trimmers and edgers, clearing the alleys and driveways, and redoing the grass edges around patios. Our job is never over when it comes to lawn maintenance. We will regularly pay your yard a visit after work is completed to ensure that our work is nothing short of excellent. We know how hard it is during the fall to deal with the tons of leaves which seem to pile up day after day. That’s why we want to give you a helping hand. Our team will use the company’s high-powered and professional leaf blowers to give your lawn that neat and healthy aspect. Our services have been appraised by our growing pool of satisfied customers who honor us with stellar reviews on Google and specialized websites. But you don’t have to take anybody’s word for it, just put us to the test! You will benefit from our 100% satisfaction warranty and our risk-free policies that back up each of our interventions. Check Lawn Care Off Your To-Do List Now. Like Right Now! We Can get you signed up for service within minutes, all over the phone. No need to wait for the other lawn care guys to not show up for your estimate, if they even answer the phone. Call us right now, WE WILL ANSWER!